Peru's striking coca farmers have given the government a 24-hour ultimatum to negotiate with them, threatening to continue their roadblocks indefinitely. Thousands of farmers are protesting against a toughening of the government's coca eradication drive. 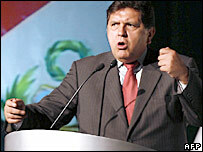 President Alan Garcia has recently announced an open war against the production of cocaine, of which the coca leaf is the basic ingredient. Peru is the second largest producer of cocaine, after Colombia. "Coca or death" is the mantra of the striking protesters, as the stakes have been raised on all sides. The protesters refuse to accept the government's toughened eradication programme and their leaders say any attempt to enforce it will result in violence. If the government does not agree to a dialogue, they say, the roadblocks on the main roads into central Peru will stay. President Garcia says there is nothing left to discuss, blaming drug traffickers for instigating the unrest among the coca farmers. His stance has been backed by the US ambassador to Peru, James Curtis Struble. He has said eradication is essential in the zone as the coca grown there goes directly into cocaine production, and the remnants of the Shining Path rebel group also operate there. The Peruvian authorities say the Shining Path are behind this latest strike and were responsible for an attack on an eradication team last week, killing one worker and injuring up to 10 police officers . 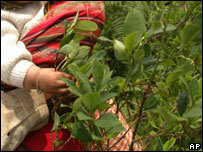 For some 60,000 families in Peru who survive on growing coca it is a valuable cash crop. But the authorities insist the vast majority of what is grown goes towards cocaine production. In a few days' time, Mr Garcia will visit President Bush in Washington to try to ratify a free trade agreement which has been thrown into doubt by the Democrat-led congress. He does not want to appear a soft touch in the US war on drugs, as cocaine production has increased in Peru and now accounts for some 90% of the coca leaf grown in the country.